There is an additional shipping fee for this product due to its weight and size. If you will be picking up at our office, please select the "Pick Up In Store" option so that you will not be charged shipping. If you would like to pay with check or cash, please call our office at (309) 837-4855 or you can purchase Chamber Gift Certificates at the Macomb Area Chamber of Commerce. You can have up to 8 keychains shipped directly to you for a $3.50 shipping and handling charge. If you would like more than 8 keychains, please contact our office at (309) 837-4855. DO NOT select this option if you will be picking your keychain(s) up at the Macomb Area Chamber of Commerce. 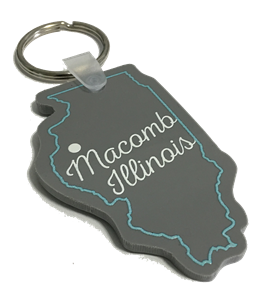 Select this option if you will be picking up your Macomb keychain(s) at the Macomb Area Chamber of Commerce.